The first Apple I (1976) was just a computer kit and although maybe revolutionary not sold very much. The Apple II (1977) is quite a different story with its stylish box, sound and color graphics it became the base for all further Apple success. 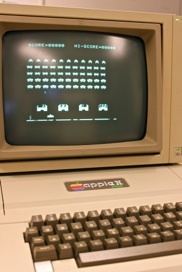 The sequal, introduced 1979, was called Apple II+. The european version for 230V and PAL video out was called Apple II europlus. My father’s company use to sell the europlus in the early 80’s and he sometimes brought one home so we could play with it. I don’t think they sold that many of them, but anyway, it grew my interest for computers and eventually spawned my career into programming and electronic music. So...the Apple II has a big place in my heart and I still enjoy the smell and sound(!) of those charming boxes. 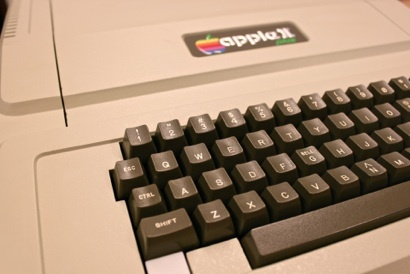 Apple II’s being more than 30 years old now, I’ve come across a number of problems with them - but all have been solvable in the end. Mainly because most chips aren’t soldered and easy to replace if broken. Unfortunately the europlus has color ability but the standard output is composite (for TV sets)monochrome. A PAL encoder card was needed for colors. Remember at this time RGB monitors were very expensive (and thus rare) so they were usually sold with a monochromer monitor or hooked up to a color TV set (hence the importance of PAL compatibility).